As I have mentioned in the past, I’m fascinated by the acrobatics of bird flocks, especially the big congregations of European starlings that gather in the evening at this time of year. Evidently I’m not the only one with such an interest. In the past few years the subject has attracted the attention of quite a large flock of scientists, including not only biologists but also various luminaries in physics, mathematics and computer science. Reynolds, Craig W. 1987. Flocks, herds, and schools: a distributed behavioral model. Computer Graphics 21(4):25–33. Author archive. This is the paper that began the modern era of flocking studies by proposing that animals could coordinate and synchronize their movements without any need for a leader or external cues. Others were thinking along the same lines at about the same time, but it was Reynolds who attracted wide notice with his enchanting computer animations of “boids” soaring through an imaginary three-dimensional space. Each individual in the flock acts according to simple, local, fixed rules, and the synchronized maneuvers emerge spontaneously. Try to match the speed and heading of nearby birds. Move toward the center of the group in which you are flying. Reynolds was working in computer graphics, and his ideas were soon taken up by movie studios and by the makers of video games. In a sense, his simulations only had to look right; they didn’t have to reflect what actually goes on in a starling’s head. But whether or not the birds were paying attention, students of animal behavior certainly were. Much of the recent activity arises out of new field studies, conducted mainly by physicists. Cavagna, Andrea, Irene Giardina, Alberto Orlandi, Giorgio Parisi and Andrea Procaccini. 2008. The STARFLAG handbook on collective animal behaviour. 2: Three-dimensional analysis. Animal Behaviour 76:237–248. Preprint. This group, coordinated by Andrea Cavagna and Irene Giardina of the University of Rome La Sapienza, has been photographing starling flocks near the city’s main railroad station (the Termini), which is just a few blocks from the university. Using pairs of synchronized cameras, the observers have captured stereoscopic images and then applied special image-analysis software to reconstruct the three-dimensional trajectory of each bird. Similar techniques have been tried in the past, but only with small flocks (a few dozen birds). The Italian group has traced the motions of individual birds in groups of up to 2,600. The two papers cited above give technical details on how the data were gathered and analyzed. Ballerini, Michele, Nicola Cabibbo, Raphael Candelier, Andrea Cavagna, Evaristo Cisbani, Irene Giardina, Alberto Orlandi, Giorgio Parisi, Andrea Procaccini, Massimiliano Viale and Vladimir Zdravkovic. 2008. 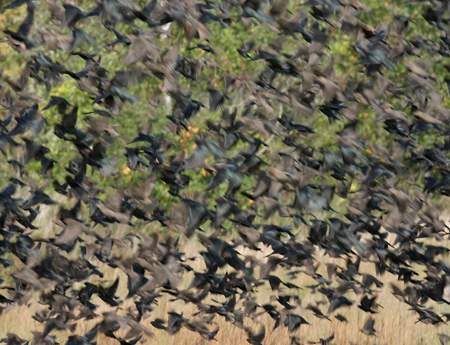 Empirical investigation of starling ﬂocks: a benchmark study in collective animal behaviour. Animal Behaviour 76:201–215. Preprint. Ballerini, Michele, Nicola Cabibbo, Raphael Candelier, Andrea Cavagna, Evaristo Cisbani, Irene Giardina, Vivien Lecomte, Alberto Orlandi, Giorgio Parisi, Andrea Procaccini, Massimiliano Viale and Vladimir Zdravkovic. 2008. Interaction ruling animal collective behavior depends on topological rather than metric distance: Evidence from a field study. Proceedings of the National Academy of Science of the USA 105:1232–1237. Open access. And here the same authors (with a few additions) report their results and conclusions. They base their interpretation on a computational model that is recognizably a descendant of the Reynolds scheme, but with one crucial modification. Reynolds and others assumed that each bird is influenced by all other birds within some fixed distance (a “metric neighborhood”); Ballerini et al. get a closer match to the data by assuming that a bird attends to the motions of a fixed number of near neighbors, regardless of distance (a “topological neighborhood”). In other words, the graph of interacting birds has nearly constant vertex degree; the typical degree is probably six or seven. The main significance of this algorithmic change is that it helps maintain the cohesion of the flock in spite of large variations in density. The model works on the same essential principles, but it differs in intellectual style and emphasis. Hildenbrandt et al. want to account for specific details of a flock’s behavior—not just the general tendency to fly in close formation but also the particular shapes of starling flocks, the maneuvers they perform, the altitudes they prefer, and so on. Reaching for this verisimilitude leads to a rather complicated model with many parameters in need of fine tuning, such as aerodynamic properties of the bird’s wing and body and banking angles in turns. Hildenbrandt et al. report some success in explaining the geometry of flocks (they tend to be horizontally flattened rather than spherical). They do less well in an attempt to account for an extra-dense layer of birds observed at the periphery of a flock. Cucker, Felipe, and Steve Smale. 2007. 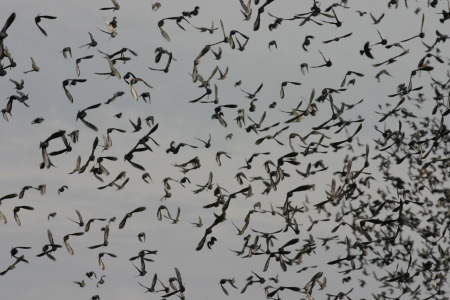 Emergent behavior in flocks. IEEE Transactions on Automatic Control 52:852–862. Chazelle, Bernard. 2009. Natural algorithms. Proceedings of the 20th Symposium on Discrete Algorithms, pp. 422-431. Preprint. Leaving behind the breathy wing-beats of living starlings, we enter a world of mathematical abstractions. Cucker and Smale, peripatetic mathematicians currently at the City University of Hong Kong, take a stripped-down model of flocking and ask this question: Is it guaranteed that all the birds in the flock will eventually settle on the same velocity, and thus fly together forever? Chazelle, a theoretical computer scientist at Princeton, asks a follow-on question: If the birds do converge on the same speed and heading, how long might it take for them to do so, in the worst case? It is rather wonderful to reflect—as you stand in a field of corn stubble admiring the flocks of birds wheeling overhead in the evening sky—that these avian entertainments should be the starting point for a line of reasoning that ventures so far into the wild blue yonder of inexpressible numbers. Lebar Bajec, Iztok, and Frank H. Heppner. 2009. Organized ﬂight in birds. Animal Behaviour 78:777–789. Preprint. I mention this piece last, but it would actually be a good place to start if you want a primer on flocking. Frank Heppner, a biologist at the University of Rhode Island, is one of the pioneers of flocking-and-swarming studies; here, with a mathematical colleague from the University of Ljubljana, he reviews many of the recent contributions and puts them in historical context. The review includes a discussion of the more crystalline flying formations of large birds such as geese as well as the amorphous flocks of starlings. This entry was posted in biology, computing, mathematics, physics. That is quite a large upper bound, considering that 5 levels of exponentiation is enough to exceed the lifetime of the known universe. What this means is even with a flock size of a handful, there is no guarantee that they will, within a given amount of time, fall into a stable state of constant velocity. I find this similar to systems in physics which become chaotic once they exceed three components, the n-body problem being a famous example. And yet the result shows that the chaos should eventually die away. This also brings to mind the behavior of certain cellular automata, where a long period of chaos finally settles into a regular pattern. What term is used to refer to the synchronized movement in a flight of birds or school of fish? Does there exist any web based videos of these simulations?